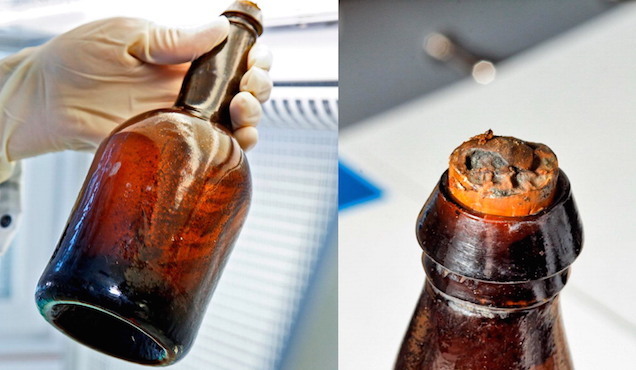 Back in 2010, divers off the coast of Finland stumbled upon some astonishingly old booze: champagne and beer preserved underwater in a 170-year-old shipwreck. Naturally, they had a taste. But now scientists are back with a rigorous chemical analysis of the beers. In the initial taste tests, the beer was so sour no one would tell how they were originally meant to taste. But when our noses falter, we have machines. Chemists at VTT Technical Research Centre of Finland looked at two particular bottles of recovered beer, which they called A56 and C49. Before they ran any tests, they recorded their own impressions of the beer’s smells, which seem, erh, largely unpleasant. Bubbles of gas, presumably CO2, formed during sampling, producing a light foam. Both beers were bright golden yellow, with little haze. Both beers smelt of autolyzed yeast, dimethyl sulfide, Bakelite, burnt rubber, over-ripe cheese, and goat, with phenolic and sulfury notes. Both bottles contained much more salt than usual, suggesting the beers had been diluted with seawater. With modern chemistry techniques, scientists are able to separate out individual compounds and by accelerating them through an electric field, figure out their molecular composition—cutting through the sourness and saltiness to the beer’s true character, in other words.